Amazon.com description: Product Description: Entrepreneur and journalist Shane Snow, and cofounder of Contently, analyzes the lives of people and companies that do incredible things in implausibly short time. From SpaceX to the Cuban Revolution, from Ferrari to Skrillex,Â SmartcutsÂ is a narrative adventure that busts old myths about success and shows how innovators and icons do the incredible by working smarter and how perhaps the rest of us can, too. How do some startups go from zero to billions in mere months? How did Alexander the Great, YouTube tycoon Michelle Phan, andÂ Tonight ShowÂ host Jimmy Fallon climb to the top in less time than it takes most of us to get a promotion? What do highgrowth businesses, worldclass heart surgeons, and underdog marketers do in common to beat the norm? One way or another, they do it like computer hackers. They employ what psychologists call ''lateral thinking'': to rethink convention and break ''rules'' that aren't rules. These are not shortcuts, which produce often dubious shortterm gains, but ethical ''smartcuts'' that eliminate unnecessary effort and yield sustainable momentum. 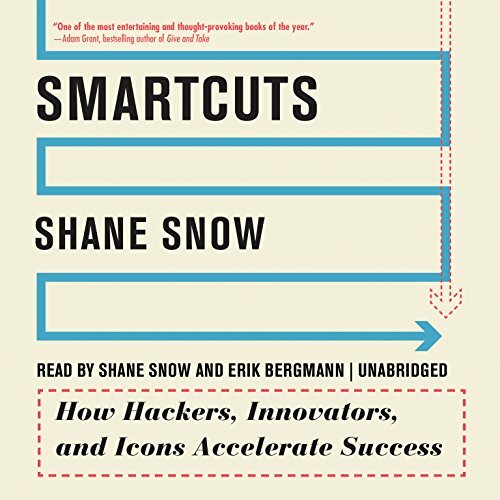 InÂ Smartcuts, Snow shatters common wisdom about success, revealing how conventions like ''paying dues'' prevent progress, why kids shouldn't learn times tables, and how, paradoxically, it's easier to build a huge business than a small one. About: Entrepreneur and journalist Shane Snow (Wired, Fast Company, The New Yorker, and cofounder of Contently) analyzes the lives of people and companies that do incredible things in implausibly short time. About: Entrepreneur and journalist Shane Snow, and cofounder of Contently, analyzes the lives of people and companies that do incredible things in implausibly short time.